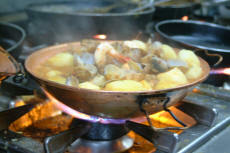 One of the region’s most notable dishes is named after the wok-like, copper pressure cooker in which it is prepared. It can be made with various ingredients but most commonly clams (ameijoas) along with small pieces of Portuguese spiced sausage (chouriço), garlic, onions, tomatoes, and a little piri-piri. Serve this with boiled new potoatoes. In a large skillet, heat the olive oil and sauté the onion and garlic until lightly browned. Place half the onion and garlic on the bottom of a large casserole dish with a tight fitting cover. Add half the clams, half the fish, half the prawns, half the spicy sausage, and half the tomatoes. Season with half the salt and pepper, piri-piri, and paprika. Repeat with a second layer.. Mix the flour with the wine and vinegar and pour over the layers. Put the cover on tightly and cook at a slow simmer for 10 to 15 minutes. Sprinkle with parsley and a squeeze of lemon juice and serve with warm crusty bread and butter.